HTB Creations: Pinkalicious New Release Blog Hop!! Pinkalicious New Release Blog Hop!! Hello everyone! 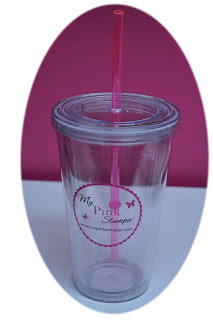 Welcome to the My Pink Stamper Special New Release Blog Hop!! If you have just come from the talented Cristi (Scrappin 5 Little Cupcakes) you are on the right track. If not, you really need to start at Robyn's blog to see the great new stamps and accessories she is releasing today. 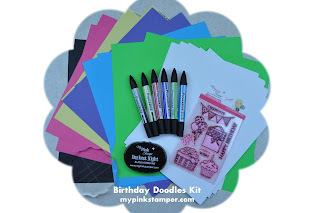 Today, we are showing you the Birthday Doodles Kit. It comes with cardstock, markers, an ink pad, clear stamp block and these fabulous stamps!! My card uses all those elements and I added some Grape Fizz Trendy Twine, Frosted Lace Stickles and some iRock Glam Rocks. 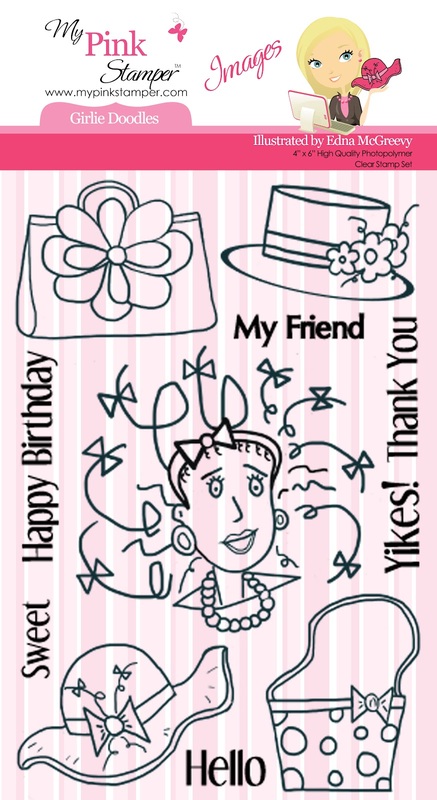 I took the Happy Birthday stamp and inked up the words separately so they were on different 'lines'. You can see all the details of the kit on Robyn's blog. And she is giving away an entire kit to one lucky person today!! Be sure to hop all the way through and go back to Robyn's blog at the end to enter. She will announce the winner at 11:45am CST (12:45pm EST) on My Pink Stamper Live! The My Pink Stamper LIVE will begin at 11:30 CST (12:30pm EST). Then all kits go LIVE and for SALE at 12:00 PM CST (1pm EST) Be sure to place your order at noon (1pm) to get the same day Priority Free Shipping. Plus, they might sell out so be sure not to miss out. The Birthday Doodles stamp set is exclusive to the kit. Have fun--and be sure not to miss out--these are awesome stamp!! Adorable card! I love the green and purple together! Great way to make the stamp the way you want it. Very cute and fun card. Love how you added the stickles!! 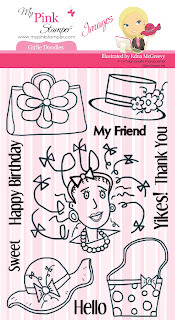 super fun card loving the way you color the balloons . I love your card. Very colorful. Thank you for sharing. Cute card! It's so colorful & I love that twine in the corner! TFS! love the colors...lime green and purple...totally ROCKS!!! SOOOOOOOOO CUTE!!! How fun to get to "play" with all these fun products! I like it! what did you use as the blue dots on the card? Love the color combo and the Twine is perfect!Lovely card! Cute card. Love the BLING! The color combination on this card is so pretty. So cute! Love how you added a touch of Blue with the colors...great job! The new MPS Kit is fantastic! Very cute card! Thank you for sharing. You did such a great job! Love the color combo! TFS! Love the colors on your card, adorable! Great job on the coloring. Love how you used the two images Helen. The way you designed the card made them work perfect together! Love your card, so cute!! So pretty, I love how you used the stamps! The details of your card are so perfect! So cute Helen, I like how you split the sentiment up like that!! My Pink Stamper May Post Day! Winner from Monday's Blog Hop!